How Bow Sim Mark created a martial arts dynasty, one student (and movie star) at a time. Early on a Friday evening, on the verge of a summer late to arrive, night falls in long shadows on the Leather District and a stream of people. The human tide from South Station has turned. The people who drifted out earlier as commuters, as lawyers and bankers and assistants to the vice president of vice presidents, now come flooding back off the trains as nighthawks, nightclub cowboys, and weekend gourmets on the make. The hustle of well-paid work gives way to the bustle of expensive play, and the area is soon as alive as it was back at noon that day, and even louder, laughter echoing down the alleys having replaced the low, important mutter of hundreds of people talking simultaneously into their cellphones. Walk down a short flight of stairs on Lincoln Street, though, and you pass from that world, as frantic at play as it is at work, into another place and – if you stay long enough – into another time as well. Seven students, all dressed in white, are carving space out of the air around them with their arms and legs. They do not move so much as ripple. They turn and bend, twist and flow, as though the basic human geometry has surrendered to a kind of fluid dynamics. At one point, they pick up swords. Some of the swords are metal. Some of them are wood. They are all solid and substantial. But somehow the bending and flowing and rippling seem to run through the students and out through their blades, making them wavery presences in the air. It as though each student has constructed a personal world with its own physics and that the movements themselves conform to the unique natural laws of these individual worlds. In the front row, in the middle of a line, there is a tiny woman doing all the same things that the students are doing, but her world seems to be more perfectly round, the equilibrium of her movements deeper and more profound than the kind that you see in the students around her, some of whom sneak looks to see what she is doing. Below the sidewalks of Boston, as a Friday night gathers itself on the streets above, this is a self-contained universe of individual worlds, all orbiting around the tiny woman in the front, who is its center and the source of the power that keeps the room in balance. 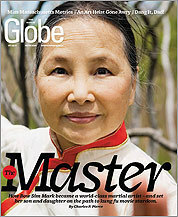 In July, Bow Sim Mark will celebrate her 35th year teaching wushu in the United States. A martial art that includes tai chi and other ancient disciplines, wushu and its movements were first standardized by the Chinese government in the 1950s. Over the decades, Mark has developed them into performances that are wholly her own and has collected an impressive list of accolades along the way. In 1984, she won the gold medal at the First International Tai Chi Chuan and Sword Tournament in China. More recently, Black Belt magazine named her one of the most influential martial arts masters of the 20th century; Inside Kung-Fu magazine upped the praise, declaring her one of the most influential of the last millennium. Mark’s specialty is wudang sword, the sweeping style familiar to most Westerners, if at all, from the action sequences in 2000’s Crouching Tiger, Hidden Dragon. (The film’s fight choreographer once said he had Mark in mind when designing the sword routines of a character named Jade Fox.) Mark melded her martial training with the arts of song and dance, which is not surprising, considering that her first performance interest as a child was Chinese opera. What she does in routines such as Tai Chi Ribbon – a performance of her own design with long silk ribbons – looks very much like a dance, but with a kind of lethality sleeping within the beauty. Mark differentiates between the “external” martial arts, which emphasize power and punching, and the “internal” forms, like tai chi and its variations, which emphasize relaxation and flexibility and work primarily through balance and leverage. Watching Mark work through wushu forms is to see a kind of otherworldly refinement. All her movements seem to exist within a carefully constructed sphere that shifts when she does. There is a radius of power and a circumference of grace that are meditative until, suddenly, Mark brings her sword from a position of rest into a powerful downward chop or upward thrust. The lethality of the action was always there; it had just been hidden by the beauty of the movements surrounding it, like swaying reeds that conceal a tiger. “People always think I am too small, a very small lady,” the 5-foot-tall master explains with a ghost of a smile. “They are wrong about that.” Back in the days before insurance liability was much of a concern, Mark would stand above the circular yin-yang painted on the floor of her studio and let her students come at her, one at a time. Several of them usually left the circle airborne. Mark not only established the Chinese Wushu Research Institute, her studio on Lincoln Street, she and her husband, a journalist, also created a kind of family dynasty in the practice. Their son, Donnie Yen, is a fight choreographer, director, and star in martial arts movies both here and in China. And their daughter, Chris Yen, began competing internationally in wushu at age 12 and now works in films. (She’s also been known to accompany her mother on piano when Mark goes through her performance routines.) Mark practices daily at her home in Newton and, though now semi-retired, still teaches a few classes a week at her studio. Her students call her “Sifu,” which means “teacher,” but which means much more than that. There is a parental element to the title as well. In the Chinese academies where Mark was taught, the master was considered a surrogate parent and the students were part of a lineage of knowledge extending back generations. This is also part of what Mark has brought to this little place in the Leather District. Next month, she will turn 69, although, if you ask her about her age or to slap a date on any particular moment in her past, Mark’s English becomes what can best be described as tactically tentative. “A long time ago” is her standard reply. But her face comes alight when discussing what she has spent her life teaching. “There are all different students,” she says, “and different students all have different gifts.” They say the best way to know any teacher is to study her students. Mark married a high school classmate, Klysler Yen, and the couple left China in 1973 with their son, Donnie. They settled in Hong Kong, where Mark took a job as chief instructor at a women’s martial arts school founded by Fu’s wife. In 1975, the family immigrated to the United States. It was in Boston that Mark fulfilled the promise Master Fu Wing Fay had seen in her by founding her own school, the Chinese Wushu Research Institute. When she opened its doors in 1976, Mark had only 10 students – wushu was still all but unknown in the West, and she was the first person in the West to teach it. And while she also taught martial arts at Boston University and, briefly, at the American Repertory Theater in Cambridge, Mark took as her real work the development of a school fashioned on the model of Master Fu’s in China – an extended family with a distinct lineage, with her as its matriarch and her students as brothers and sisters. This necessarily included her own children, who were also her students and who many times found themselves, formally and informally, working in the tai chi equivalent of in loco parentis. On the surface, Chris Yen is unlike her mother. She is almost preternaturally cheery yet deadly straightforward, and she fairly vibrates over whatever has managed to engage her enthusiasm, which is practically everything. At the same time, she has come to grips with the fact that growing up as the daughter of Bow Sim Mark meant that she would be raised just a little differently from all of her bike riding, skateboarding peers whipping over the hills of Newton. “My childhood consisted of seeing my mom in the light of a master, more so than to have had the personal, private mother-daughter relationship at home,” she says. “I didn’t have a normal childhood. I don’t remember playing in a playground. I didn’t get to go out a lot.” Her mother was too gentle to be a Tiger Mom, that preposterous postmodern Charlene Chan marketing construct that blew up in everyone’s face last winter. Master Mark’s strength as a person sprang from the same source as her strengths as a martial artist. It was internal, but that didn’t make it any less formidable. It was unsurprising, then, that Chris developed into a champion like her mother. As the youngest competitor in a 1985 international wushu tournament – the first in which the Chinese government allowed outsiders – the 12-year-old placed second in sword, besting women far older and more experienced. She was immediately cast in a Hong Kong film called Close Encounter With the Vampire. Later, the director told Mark he could turn her daughter into a bona fide star. Mark said she was too young. Fame would have to wait until her schooling was finished. Chris was largely alone at home, because her older brother, Donnie, was already a movie star. More than a decade her senior, Donnie had been invited to China to train in the same school that produced action star Jet Li. From there, he moved to Hong Kong, where he became the protege of Yuen Woo-ping, the director who launched the career of Jackie Chan with kung fu classics like Drunken Master, but who later became famous in Hollywood for choreographing the fight sequences in The Matrix and Crouching Tiger, Hidden Dragon. The best way to know a teacher is to study her students, even the ones she’s raised at home. Different students, after all, have different skills. All of Mark's students came to her for their own reasons. Jean Lukitsh came because she was curious. In the summer of 1978, Lukitsh was living in Pittsburgh and just beginning to study tai chi. One of the other students in her class told her about this Chinese woman who was running her own school in Boston. Lukitsh immediately scheduled a trip. After her first visit to the school, she bought a uniform, paid a month’s tuition, and asked an Allston real estate agent to find her an apartment. “I went home and told my family I was moving to Boston,” Lukitsh recalls. “I said I’d probably spend one to three years in Boston, and then I’d be back. That never happened.” Over the years, Lukitsh has become the unofficial archivist and spokeswoman for Mark and her school. She sets up interviews and, occasionally, helps coax answers from her teacher. Cecilia Wong came to Mark because she was shopping for martial arts classes that didn’t look like rehearsals for a summer stock version of The Matrix. After leaving the Navy in 1986, Phelps was accepted at Harvard. To him, moving to Cambridge also meant coming within the sphere of the legendary wushu master he’d been told about. “I’d heard about her for years,” Phelps says. “So I got on the Red Line and took it down to Chinatown three or four times a week to practice privately with her and to take classes.” Even when he continued his studies at Yale Divinity School, Phelps traveled to Boston at least twice a week to train. And that is the last illusion created by the swirl of the ribbons and the sweep of the blades. In the middle of the room, if you glance too quickly, the grandmaster doesn’t look like anything more than another one of the students. You have to watch carefully to see how all of the activity in the room revolves around her, but once you do, you see plainly that Mark is the unshakable center of gravity holding all of the rest of it in balance. In a jagged world, there are still places where things flow. She reaches over and corrects the hand position of one of her students by a fraction of a degree. Somebody starts the music over again. Charles P. Pierce is a Globe Magazine staff writer. E-mail him at cpierce@globe.com.